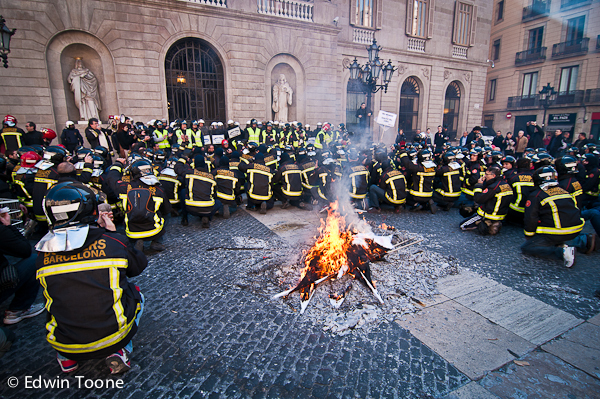 Last week while working on an ad for the upcoming Mobile World Congress I came across this protest of the firefighters union in Place Sant Jauma. I think they were protesting for better working conditions and better pay but I am not sure. They are pretty exciting group to watch in a protest because they come prepared. Not only are they a group of big tough guys and gals but they wear heavy jackets and helmets, they carry loud firecrackers at the end of sticks and they have no problem starting little fires. When they clashed with the police (which is very common here) they really got pretty violent and looked like they might just over power them. The protesters were hitting the police with their signs and fist and the police were hitting back with their batons. Each little scuffle was intense but controlled. It was almost like a little game and at the end the protesters kneeled down, did a little chant then stood, clapped hands, and patted each other on the back. There were no arrest made as far as I could see and almost a kind of a “see you guys later, it’s been fun” between the firefighters and the police. I understand that the police and the firefighters often have to work together and maybe they have more respect for one another than say a student protestor or an anarchist but this situation raised some serious questions for me. Why treat the firefighters so differently than other protesters? Maybe because their group is smaller, maybe because of the working relationship they have or maybe just because they are tougher? I don’t really know but I get pretty bent out of shape when I see a group of students sitting non-violently protesting and the police decide it is time to move them so they start swinging their clubs. I have seen this several times here in Barcelona and not only does it appear unjust but also unprofessional and embarrassing on the part of the police.